I have a GE side by side, model GSL25JFPDBS, purchased late 2005. Fridge side started getting warm on Friday, suddenly cold again Sunday,then warmed back up and stayed warm - hasn't been below 56 since. Ordered defrost thermostat and thermistor (replaced the one on tube above defrost thermostat) and replaced them on Wednesday. While waiting for those parts to arrive, Tuesday morning I got up to my freezer having thawed. from freezer side and it slowly swings up, stays for a bit, then closes again. Fridge is still 56-60. Right now, freezer is just below 30; earlier today it was at 7.
fan comes on, sometimes it doesn't. praying a lot - but hoping for an opinion from you on my logic. I'm a single mom and can't buy a new fridge, so I'll take any input I can get. When you replaced the thermistor and the defrost thermostat did the coils look blocked with ice like the ones on this page GE Refrigerator Not Cooling? I also put the picture at the top of this page. If so did you get all the ice melted and is it back like that again? It is normal for the damper to close when you have the doors open to the refrigerator, you can press the door switch to see if it opens back up. If all checks ok replace the main board. GT221BMARWWMA307325 both upper and lower fans are working compressor is not coming on. 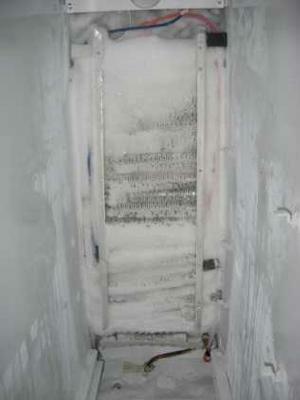 I opened freezer one night and everything was thawed out. What do you think the problem is??? If both fans are working and the compressor isn’t then more than likely you have a bad board. (unless the compressor is hot then it could be the compressor start relay). Take the board off and look on the back of the board for burn marks. It is common for a solder joint to come lose causing this issue and if this is the case the joint will be burnt looking. Replace the board and it should go back to work. I have found many with this problem and quite often a bad relay on the board is the culprit and is usually easily fixed with a drop of soldier. This page talks about repairing solder joints. First off, I am not sure what year our GE side by side fridge freezer model is (ESH22XGPA). I believe we bought it about 7 -8 years ago, but can't be sure...can't find original paperwork. The freezer works fine but fridge temp is too warm. It fluctuates between 40 degrees and if door is opened shoots up to 45 - 50 and stays there for a while. At one point the temp never dropped and it ceased to cool at all. In the freezer we discovered there was no frost on the bottom back panel but there was frost build-up on the top back and around the vent area that goes to the fridge...so we took a blow dryer and melted it and the fridge started to cool again hours later. But the temp never went below 40 degrees and the frost started to come back again a few days later on top back of inside freezer. We have the temp setting at 9 now. We had a repair guy out and he never removed the back freezer panel to look at the coils as he didn't think it was a defrost issue since there was no frost on lower back inside freezer - he was perplexed (or not experienced enough) as to what the issue could be and left without repairing anything. We have looked at the door seals and they all look good - no cracks and they seam to hold the seal just fine as far as we can tell. The first issue was both freezer and refrigerator became warm. I tried changing a thermistor as a shot in the dark with no affect. I then researched Shawn's videos (excellent explanations and instructions) and other trouble shooting and discovered the compressor wasn't running. After testing with a multi-meter, I determined the Inverter board was bad, replaced it and all worked again. A few weeks later the Frig side started warming, and there was condensate in the Frig compartment near the damper door in the left-top. I thought that the damper door might not be opening, and I thought it might be the thermistor in the frig because it was cold due to the condensate. I tried heating it with hot water, and it did seem to work for a few times. I followed Shawn's video to do the testing of the defrost cycle using the plugs on the control board to test the defrost thermostat and the heater element and they had continuity. I then tested the evaporator thermistor which tested fine as well. I tested the evaporator fan from the board, and it had the 13+ DC volts from the J2-3 to the J2-8 connector. However, when I test the J2-3 to the J2-4 I am getting 13.68 volts also instead of 12 or 8 or 4 as Shaw indicates. Originally the evaporator fan was running before I dismantled, now it isn't. From Shawn's video, this indicates it is the control board, and that both fan and control board should be replaced. I am double checking the testing, including testing the fan removed from the refrigerator, since it is expensive. One of the things we learn from Shawn's videos is that things are connected. So I am trying to figure out if the original issue with the inverter was caused by the defrost issue. It seems likely that the compressor was running more and this led to the inverter overheating. But I am not sure. If Shawn is reading maybe he can comment. The only thing I will note is that 13.68 is 12 volts for all intents and purposes when it comes to testing this sort of thing. The .32 volts you are not seeing is negligible.